Your first step towards feeling like a professional Chef. Put your stirring or tasting spoons in your BABETTE™ on the saucepan. Making your everyday easier. 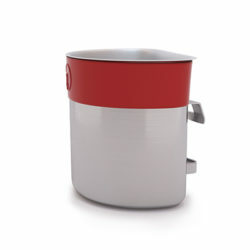 Find us in your nearest kitchenware store or buy it online here. Recommended by one of the greatest Chefs in the world; Ørjan Johannessen. A good workflow and tidy counter space is important for every chef. Simply hang your BABETTE™ on the edge of your pan and keep your spatula, spoon, etc. right where you need it. Beautifully elegant. You kan also use BABETTE™ as a measuring cup. 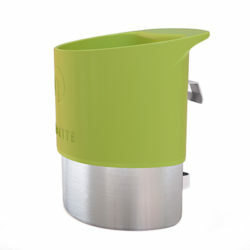 Measure, mix and pour, directly from your BABETTE™. We aim to equip you and your kitchen with clever solutions. 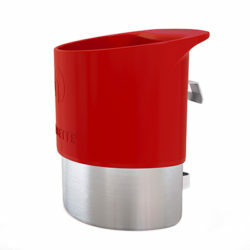 BABETTE™ Steel is suitable for gas and electric hobs, and comes with a red and black silicone collar to protect your fingers from the heat. 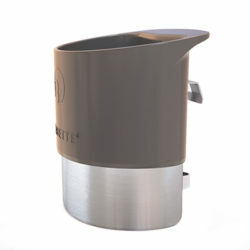 BABETTE™ Original withstands high temperatures, but must not be put directly on a heat source like gas or open flames. Our GRIPTECH™ technology allows you to adjust your BABETTE™ to fin your pan. BABETTE™ has been launched on the global market and will be available in stores in several countries. Please contact us at post@gripgroup.no for more information on where you can purchase your BABETTE™. 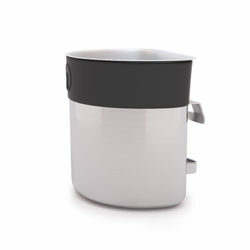 BABETTE™ is sold in designated stores for kitchen supplies. Just ask for it by name. You can also buy BABETTE™ online at this site. BABETTE™ is the perfect gift and it also makes a treasured prize in local games, both private and business related. You may even. tailor the selected BABETTE™ with an engraved text, a logo, a symbol or even a small poem at an additional cost.